From updated classics to modern single- and double-cuts, signature models and seven-strings, here are the guitars that give you the most bang for your buck. Get superior tone and playability with Guitar World's list of the top axes, from Strats to seven-strings to signature models. Get great tone and playability in a range of sizes—and with all manner of upscale features—with Guitar World’s guide to the top mid-priced acoustics. Today’s top metal machines, from signature models to Vs to seven and eight-string monsters. Blues guitarist’s signature model boasts single Seymour Duncan P-90, ebony fretboard. 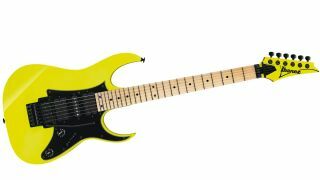 These 10 axes offer fantastic tone and great playability at prices that won't leave cobwebs in your bank account. The Epiphone Les Paul SL is an affordable, solid guitar with playability and pickups that give it larger-than-life swagger. New guitar is a modernized take on the Seventies-era Epiphone Del Rey Double Cut. Limited-edition model is based on the guitarist's custom ES-355. Stay tuned to GW for all the best gear deals of the holiday season. New model will be a more affordable version of the superstar Guns N' Roses guitarist's signature Gibson Firebird. From EVH, to Martin, Fender, D'Addario and Taylor, GW dishes on the best this year's Summer NAMM had to offer. In celebration of Epiphone's new Peter Frampton Les Paul Custom PRO, here are 10 great moments from the guitarist's career. Epiphone and Peter Frampton have teamed up to create two brand-new guitars.